The Wave Panel from Tangent Devices is designed to incorporate the features and functionality of Tangent's CP100 and CP200 series panels in an equally useful but more economical package. This compact unit features custom trackerballs that use non-contacting optical pickups and easy-to-read cool-blue OLED displays. Numerous control interfaces include control knobs, label buttons, function buttons, master dials, and transport controls. Augment your favorite video-editing software package with this panel. The unit's controls have been designed to provide an intuitive interface that meets your needs and facilitates your workflow. Box Dimensions (LxWxH) 23.4 x 21.4 x 4.6"
Wave Panel is rated 4.6 out of 5 by 16. Rated 4 out of 5 by Adrian from Great Buy for the Money This is Tangent's lower cost entry into the color-correction control surface market. I prefer their CP200 panel as its build and feel is better but it also costs almost four times as much. And the CP200 does not support the wide range of applications that the Wave panel currently does. 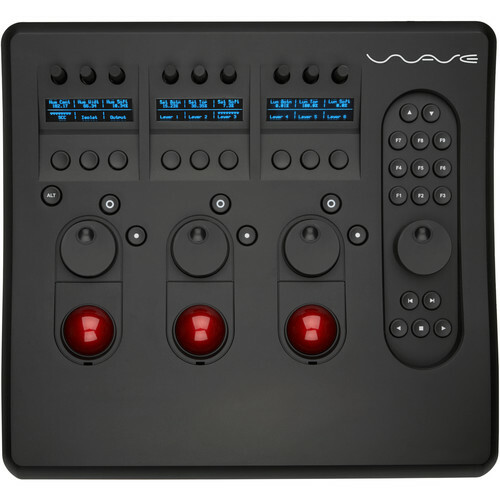 I use the Wave primarily with Iridas SpeedGrade and the integration is seamless. It also works wonderfully with Apple Color and the new $1000 software-only release of DaVinci Resolve. The Wave is well worth the price for professional results. Rated 5 out of 5 by JoeyMcFlow from Perfect for coulorists starting out I got my Wave panel two weeks ago, and use it with DaVinci Resolve 9 Lite on a Windows PC. I'm an editor who is getting into the colourist profession and i could not be happier with this purchase.It took 1 minute to install. Hooking it up with Resolve was as easy as selecting it from a list and it was instantly fully functional. You get the key map off the internet, and after 1 hour i was using nothing but the controller to navigate and grade basic grades. So far I've used it to grade a two music videos and one short, and I have not once thought it to be inadequate. Not to mention it's very light, and you can easily bring it around to work in several places each day! It requires one USB plug, and it's good to go. No external power.I have on a few occations noticed the colour balls can be a bit unresponsive, but i suspect this has more to do with the communication with my external HDD's rather than the panel itself. Also, the keys are not customizable for mapping (In Resolve), atleast not without third party software, but for me this has not been a problem. I can understand colourists with years of experience seeing this as a huge con, but for me, it was not an issue.Bottom line: Are you starting out, grading anything but huge projects, or moving around alot, the Tangent Wave panel is bang for your buck. I could not be happier. I wouldn't trade it for anything but the Resolve Control Surface. And I've tried other models. Rated 5 out of 5 by Dave Dunville from Worth it's weight in gold This is the icing on the cake that is my editing suite. It has sped up my workflow by two or three times. That's a big deal when your in a time crunch. Setup was extremely easy, the software it came with was a two step process, and the mapping of the panel was extemely intuitive. What I thought was going to be a flaw was the maintenence of the panel. I figured over time dirt would build up under the trackballs but the panel was built with removable tabs that allow you to easily take the trackballs out for cleaning. The only things I would consider a con (though they really aren't) is that it takes a lot of deskspace. (big deal, get a bigger desk) and the button clicks are kind of loud (but whatever) Overall, extremely pleased with it's ease of use, performance, and look. Rated 4 out of 5 by Anonymous from Works well Good points: - much and much better than working with a mouse - trackballs work well - I like the glowing text! - good support for RedCine-X, Apple Color and Resolve for Mac Bad points: - it feels and sounds hollow and makes a 'clack' sounds which makes sense since it is mostly air inside! Rated 5 out of 5 by Nate P from Great for Davinci Resolve In Davinci Resolve it speeds things up tremendously. Use it to control primaries, power windows, scrubbing and playback, etc. Only thing thats not so great is that you have to use two bottons to toggle through the 9 menu screens so its often faster to just use your mouse to select things on the screen, but if i needed to access all the buttons I should have bout the $30,000 davinci control surface...So, still a great panel, especially for the price! Rated 5 out of 5 by Anonymous from So Far so good Since I have the Wave, my workflow in Color and Resolve is faster than ever, and my clients are very happy with that, of course is just a tool, because all the good work is made by me. The only downside is the size, a little bigger to my work area. Has anyone use this product with Lumetri Color inside of Premiere Pro? Is this product compatible with DaVinci 12? Yes Blackmagic Designs DaVinci Resolve 12 is compatible with Tangent Wave. I'm not sure--. It should be compatible. The absolute answer is found on the site TANGENT WAVE 2 where it shows all the supported software-good job. PS/I tried WAVE 2-the result is great. If I am using Premiere Pro and Resolve how difficult is it to switch between the two programs with this controller? Do you have to remap the controls between the switch from one program to the other? 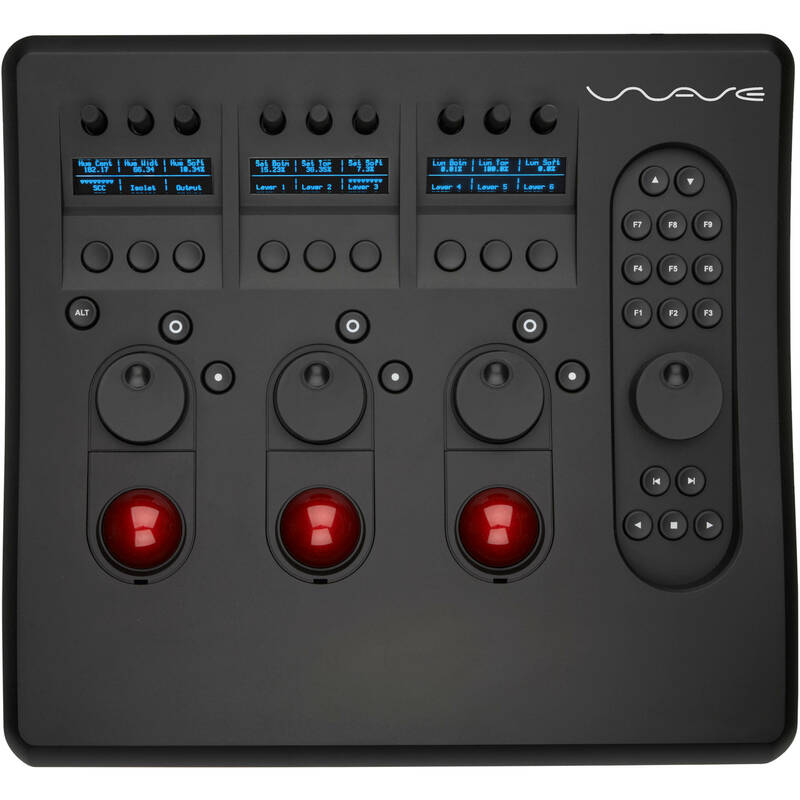 Resolve support for the Wave panel bypasses the Tangent Hub process which means that Resolve needs to be quit for Premiere to gain control and vice-versa. The control layout will switch automatically to match the application which is being used.When running multiple applications which ALL support the Tangent Hub then switching between them is simpler - just bringing the application to the foreground should cause the panels to follow. It's only because Resolve support for the Wave panel was added before the Tangent Hub process was released that switching back and forth with Wave&amp;Resolve isn't quite so simple. Resolve does use the Hub for Element &amp; Ripple panels though so application switching with these is slightly more user friendly.